Find out how play can connect and inspire your team, and jump over traditional boundaries so you can get things done. Kathy Oppegard helps people and organizations bring resilience, playfulness, and creative problem-solving (through as many corny jokes as possible) into their workforce and volunteer teams. Inspiring and funny, Kathy rolls practical tools and inspiration into talks to motivate your audience so they go home thinking and laughing. 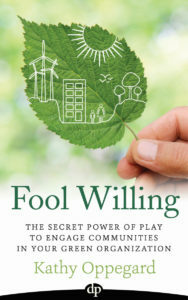 Author of Fool Willing: The Secret Power of Play to Engage Communities in Your Green Organization, Kathy Oppegard loves excellent dark chocolate, silly stories, and helping people laugh while solving big challenges. Contact Kathy at coaching@foolwillingbook.com about booking her for your organization’s next meeting or conference.